Carpets can be a major investment for home owners, it can cost between $1000 to $10,000 and beyond to carpet an average size home. Such an investment is worth protecting, and most carpet manufacturers recommend having your carpets professionally cleaned at least once a year. Most people do not realise that. Not all carpet cleaning services are equal, however, and it is important you choose the best, most qualified, and capable cleaner to take care of your investment. When selecting your carpet cleaner, consider the following points – they might just help you to avoid disappointment, inconvenience or ongoing problems. Is There A Certification System For Carpet Cleaners? There is a body which not only certifies but also sets standards for inspection, cleaning and restoration in countries such as Australia, NZ, US, Canada, UK and Japan. That body is the IICRC – Institute of Inspection, Cleaning and Restoration Certification. IICRC certified technicians display the ‘cleantrust’ logo to demonstrate their proficiency both technically and ethically. One of the first things to check therefore, is whether your cleaners are ‘cleantrust’ trained and whether they comply with the rigorous standards of ethics and expertise required for IICRC certification. have a written complaint system and agree to arbitration to resolve any disputes, including agreement to accept any and all conclusions or recommendations arising from arbitration. IICRC certification is not a requirement of the carpet cleaning industry, which at this stage is unregulated. Without a formal system of regulations many carpet cleaners operate without having received any formal training. Therefore the first question asked should always be about qualifications, training, experience and whether your home is covered by their public liability insurance policy in the event of any damage. Having determined that your potential carpet cleaner offers a reputable and reliable service, your next question will likely be about price. The obvious ‘buyer beware’ cautions are valid here. When a price seems too good to be true, it often is. If you are expecting a high level of service you should expect to pay for it. 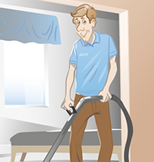 To give an accurate quote it is important your carpet cleaners inspect your carpet. Any over-the-phone quote can only be an estimate. This is despite the fact that many companies offer a standard price per room, or per square metre. There may be individual variations in the specifics of your home, the type and condition of your carpet . Any quoted price should include basic spot removal, the moving of furniture (by arrangement) and pre-vacuuming. There may be added extras such as deodorising, sanitising and/or carpet protection available for an additional fee but these should be specified upfront. Some companies charge what seems to be a ridiculously low price to secure a job. Upon arrival however they attempt to convince you that other services such as spot removal or sanitising are needed and should be paid for, inflating the cost of the job to well above the low initial estimate. The time required is completely dependent on the size of your home, how much furniture needs to be moved and the specific cleaning system your carpet cleaner uses. The carpet drying time should also be estimated. Whilst it is variable it shouldn’t take longer than 6 to 8 hours. Professionals only leave your carpets damp to the touch never wet! Carpets may be steam cleaned or dry cleaned. 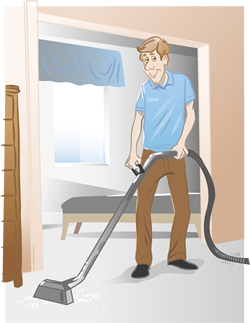 Steam cleaning is also known as hot water extraction and is the method recommended by carpet manufacturers. It is suitable for most carpets. There are two types of steam cleaning units. One is a portable machine. The other a truck or van mounted unit which is more powerful and offers a more thorough job. 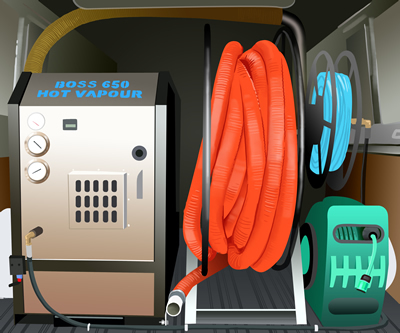 Only about 13% of carpet cleaners have a truck-mounted unit because they are the best and have a hefty price tag. Take a look at our consumer awareness guide for more info on cleaning methods. During steam cleaning the carpet is vacuumed, a chemical that bonds with the soil is sprayed on and then a high pressure jet spray is used to inject water into the carpet. The water with dirt, fungus, bacteria, pollen, chemicals and other residue are extracted. Dry Cleaning is referred to as surface cleaning and recommended as a high traffic area clean where a fast drying time is needed. Dry cleaning is considered to be more of a ‘maintenance clean’ so steam cleaning is therefore still recommended. It is always good to check whether your carpet cleaner can perform other cleaning services such as tile cleaning, upholstery cleaning and restoration, leather cleans and restoration. It will give you a picture of the cleaning capability and expertise of your chosen cleaner but also may allow you to have tiles and carpets professionally cleaned in one visit. Ensure that your potential carpet cleaning companies offer guarantees. Workmanship guarantees are commonplace in business today and offer you an indication of what you can do if you are not satisfied, or your carpets have been damaged. There are a number of things you can check when choosing your carpet cleaner to ensure you get a high level or workmanship and service. The most important of these are to do with certification, insurance and guarantee. Without this peace of mind, the method used and equipment available almost become irrelevant. Remember when checking out possible carpet cleaners that it is an unregulated industry and that any company who has sought voluntary certification is a company prepared to go to extra lengths to deliver superior service and workmanship to your job.